SOUTHERN CALIFORNIA (ANS – July 29, 2015) — Notorious executioner Mohammed Emwazi is believed to have fled Islamic State because he believes the terror-based caliphate has no further use for him, according to a report by the UK-based Daily Express. 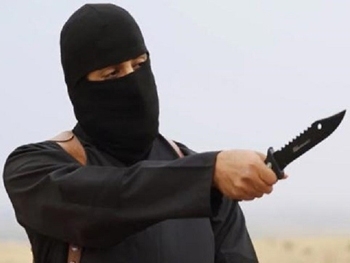 It is thought that Emwazi, also known as Jihadi John, left the hyper-militant group a few weeks ago and is on the run in Syria – reportedly headed for North Africa. A U.S. intelligence source was quoted as saying he is hiding in Libya. Kuwaiti-born Emwazi is wanted for the horrific beheadings of journalists and aid workers Stephen Sotloff, James Foley, David Haines, Alan Henning and Peter Kassig. Jihadi John first appeared in an August 2014 video, dressed completely in black with only his eyes exposed. He spoke with a British accent, but authorities did not reveal his identity until February. He has not been seen in any videos since January, leading some to speculate he might be dead. Islamic State would drop him “like a stone or worse if they feel he is no longer of any use to them,” a source told the Daily Express. “So it is possible he will end up suffering the same fate as his victims”. The British terrorist, originally from London, was said to be unnerved by the publicity he received after he was identified as the murderer of the British and American hostages, according to the source. He knows British and US Special Forces in Iraq and Syria are hunting for him. They would like to apprehend or kill the 26-year-old terrorist. Emwazi is alarmed by the fact that his unmasking has reduced his value as an Islamic State killer, according to the Daily Express. A school friend of the terrorist said Emwazi was “not a good Muslim” during his school years. He dressed “like a gangster rapper, smoked drugs, drank and was violent towards other boys,” the anonymous friend told the Daily Express. Photo caption: The shocking act of beheading David Haines. About the writer: Mark Ellis is a senior correspondent for the ASSIST News Service and also the founder of www.Godreports.com, a website that shares stories, testimonies and videos from the church around the world to build interest and involvement in world missions.